a fountain of wisdom 知恵の源泉. The amplifier exploded in a fountain of sparks. From Middle English [Term? ]; from Old French fontaine (whence modern fontaine); from Late Latin fontana, from Latin fontanus, fontaneus, adjectives from fons (“source, spring”). (originally) A natural source of water; a spring. A little fountaine became a riuer, and there was light, & the Sunne, and much water: this riuer is Eſther, whō the King married and made Queene. An artificial, usually ornamental, water feature (usually in a garden または public place) consisting of one or more streams of water originating from a statue or other structure. The structure from which an artificial fountain can issue. A reservoir from which liquid can be drawn. A source or origin of a flow (e.g., of favors または knowledge). (heraldry) A roundel barry wavy argent and azure. (juggling) A juggling pattern typically done with an even number of props where each prop is caught by the same hand that throws it. (intransitive) To flow or gush as if from a fountain. Lava fountained from the volcano. The fireflies swept toward him from all directions, in streams and rivers and currents of light, a vortex a hundred yards across, spiraling into the brighter center. They met over his supine body like ocean breakers, cascading, fountaining into the air. ^ “fountain” in Dictionary.com Unabridged, Dictionary.com, LLC, 1995–present. 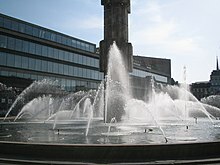 A fountain (from the Latin "fons" or "fontis", a source or spring) is a piece of architecture which pours water into a basin or jets it into the air either to supply drinking water or for decorative or dramatic effect.